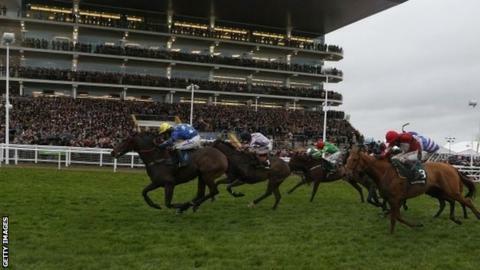 Annacotty won the Paddy Power Gold Cup at Cheltenham as jockey Ian Popham held on in a thrilling finish. The 12-1 winner was running in his first race for trainer Alan King after being moved from Martin Keighley. Annacotty held on from the fast-finishing Buywise, with Sound Investment third and Double Ross fourth. Popham, who has endured an injury-plagued career, was congratulated afterwards by Keighley. "That was the most incredible feeling. I thought my career was on its backside," said Popham. King added: "Ian has been riding him at home and reckoned he was in good form and the change of scenery has probably helped freshen him up a little." Favourite Kings Palace, trained by David Pipe, finished down the field in 11th place. Jockeys wore black armbands with tricolours as a mark of respect for the victims of the Paris attacks in which at least 128 people were killed. A minute's silence was observed before racing. "Racing is a sentimental old thing and loves to celebrate a fairytale win for an underdog, and Ian Popham's victory on Annacotty was just that. "While injury is part and parcel of being a jump jockey, Popham's had more than his fair share. "So a great day for him against better-fancied, better-known rivals, and little wonder he was emotional about it afterwards. The horse has recently moved stables and is clearly on good terms with himself; a return to Cheltenham for the big steeplechase in mid-December seems likely."